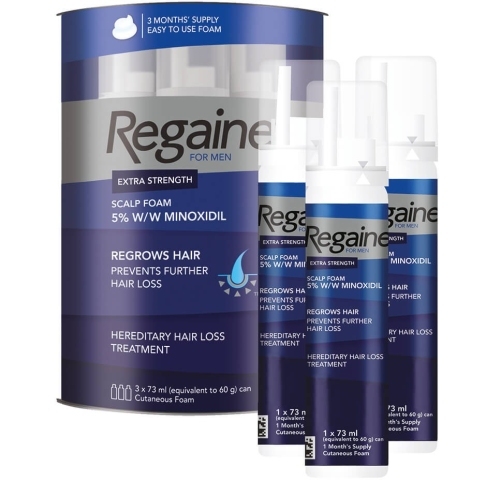 Regaine is a hair product that contains the active ingredient minoxidil. It is used by men between the ages of 18-49, who are experiencing hair thinning around the scalp region. Regaine works by increasing the blood flow to hair follicles, stimulating them to regrow hair, as well as prevent further hair loss. It is available to buy without a prescription from most high street and online pharmacies. Regaine should be used twice daily, and takes around 8 weeks to work. It is effective in around 80% of those that try it. Regaine works by increasing the flow of blood to vessels in the scalp. In turn, there is an increased blood supply to the hair follicles, giving them access to a rich supply of oxygen and nutrients. This stimulates the hair follicles to produce thick and long hair which is visible. This process also works to strengthen existing hair, reversing hair loss. Another study conducted over a four-month period, found that the balding region had got smaller in 67% of men. It was reported as "very effective" in 8% of men, "effective" in 55% of men and "moderately effective" in 31% of men in stimulating new hair growth. Doctors found that hair density (fullness) was improved in 74% of men. Regaine is one of the most popular treatments for male pattern baldness because it has a successful track record with proven results. How do I use Regaine? How long does it take for Regaine to work? It takes around 2 months of consistent use before you will notice the effects of Regaine. If you have been experiencing hair shedding after the first few weeks of using Regaine, continue to use it. This is a sign that Regaine is working, as your old hairs need to shed in order to make way for newer, healthier hairs. From around 3-4 months, you should notice that hairs are appearing to look thicker and your hair has a fuller effect. Whilst this is the general consensus, everyone has a different rate of hair growth and it may take slightly longer before you see results. If you have not seen any improvement after 6 months, you should stop using Regaine. During the first few weeks after starting Regaine, you may experience an increase in hair shedding. This is normal and a good sign, signalling that your new growth cycle is ready to begin. The older hairs are shedding to make way for newer, healthier hairs and with time, you should experience thicker and fuller hair growth. When should I stop using Regaine? You should continue to use Regaine for as long as you wish to see results. The natural balding process will continue after you stop using Regaine. What if Regaine is not working for me? You should give it 6 months before deciding whether or not Regaine is working. If you are not experiencing any visible results after 6 months, you should discontinue treatment. Another alternative treatment for male pattern baldness is finasteride. You should discuss with a doctor or pharmacist whether this treatment option is suitable for you. Who should not use Regaine? Can I use Regaine if I am taking other medication? What is the difference between Regaine foam and liquid? The active ingredient is exactly the same in both Regaine foam and solution. The benefit of the solution is that it allows you to measure the exact amount (1ml) accurately, whereas the foam application relies on you to estimate the correct amount. However, the foam is easier to apply and many men have reported that is looks less greasy. What is the difference between Regaine and Rogaine? How can I buy Regaine online? You can buy Regaine online from our regulated UK pharmacy. You will need to choose the quantity required, answer a few short questions, and then checkout. This process ensures that Regaine is safe for you to use. We try to keep our prices as low as possible, and dispatch all orders using a next day delivery service.